Soft pastels feature an easy-to-blend texture to make them great for experimenting with new techniques and take your art to the next level. Their handy square shape provides a comfortable grip for easier application. The pointed corners are great for defining and filling-in fine details while the flat sides let you quickly color larger sections of your artwork. 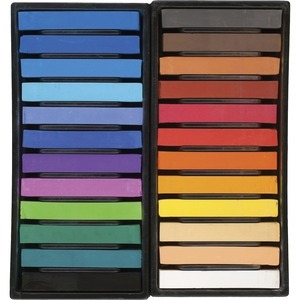 24 assorted colors with beautiful pigmentation ensure your artwork is never limited by a lack of options. Soft pastels are perfect for aspiring artists, students, hobbyists and more.